Deleted skill when changing weapons. Npc buff time 2 hours. Aio buff time 3 hours. 1st, 2nd, 3rd job free. Clan level 8, skills and reputation free. Advanced cancel - buffs return by 30 seconds. Limited access - 3 sessions per PC. Offline shop - Open store and exit game. Vote system - Npc located in Giran Town. Wedding system - Npc located in Giran Temple. Champion system - Drop adena x5 and high-grade lifestone. Color system - 1000 2000 3000 4000 5000 6000 7000 8000 9000 10000. Equipments up to A-Grade on sale by adenas. Equipments S-Grade on sale by farm. Exchange s-grade items for dynasty items, maintaining its characteristics, as well as the exchange s-grade jewelry for the boss's jewelry. The system uses the Pollen as payment method to perform such operations. Pollens can be obtained in farm zones or in bosses. The drop chance of Pollens in farm zones is low. These values will not be revealed. The drop in bosses are larger, being: 15% in Raid bosses and 100% in Grand bosses, with the exception of Orfen and Core, both with 30%. Alliance disabled - only 1 clan. Clan and alliance penalties - 2 hours. Clan maximum capacity - 40 members. Not allowed to use equal flags - the clan leader will be subject to punishment. .bank - Tells how to operate the banking system. .expon - Enables the gain of experience. .expoff - Disables the gain of experience. .time - Displays the server time. Oly period ends - days 1 and 15. Battle time - 20h ~ 00h. Battles per base class disabled. Number of registration to start - 5 players. Siege period - 2 weeks. Battle time - 18h ~ 20h. Siege with payments on donation tickets. Capture the Flag - automatic system, every 2 hours. Team vs Team - automatic system, every 2 hours. Flame of Splendor Barakiel - respawn time 4h ~ 8h. All Raid bosses - respawn time 12h ~ 24h. All Raid bosses level 85+ have custom drops. All Grand bosses respawn time between 18 and 00 hours. All Grand bosses are level 85+, jewelry drop 100% and are Chaotic Zones. Ontem a noite, em Giran. 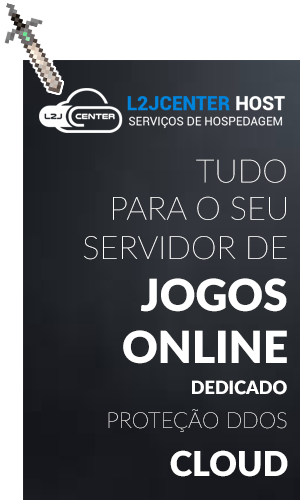 tem como vc me endica onde voce compro essa sua Rev para coloca seu servido ON ?? ?